* SMA Solar Inverters: On grid, Off grid and Hybrid systems and design and engineering support. * Jinko Solar PV panels, 325 Poly and 345 Mono, 5 bus bar, 72 cells. 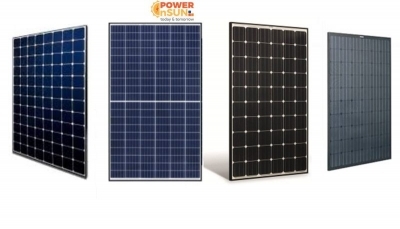 * AUO, High Module efficiency, 20%, Mono crystalline back contact cell, 327 Wp, 96 cells, panel size 1559 x 1046 x 45 mm. * Sharp Mono crystalline, 360 Wp, Module efficiency 18.5%, 72 cells. * Sun Power Modules, Poly, Mono and high efficiency modules for roof top installation. * DC Cables, made in India, Electron beam irradiation technology, TUV certified. * Complete range for connectors, made in India, TUV certified. * Combiner boxes with multi stings input and outputs with Surge protection devices (SPD), DC disconnector and fuse and fuse holders. * Anodised Aluminium structures for various Roof tops. * All in one Solar street lights, approved by Dubai municipality. * OPZV, Pure deep cycle Gel, deep cycle, AGM standby (12V,2V,6V,8V). * Lithium Ion stackable batteries with 10 year warranties. * Solar water pumps for irrigation. * Off grid and Hybrid small inverters, Polaris and Su-Kam from Taiwan and India. * DC refrigerators and Air conditioners.